645 J. Clyde Morris Blvd. Send me the Bonus 7 Day Quick Start Weight Loss Plan! 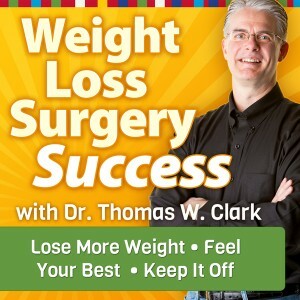 This entry was posted in Podcasts, Weight Loss Fitness, Weight Loss Nutrition, Weight Loss Surgery Success and tagged balance, CFWLS, childhood obesity, diet, Dr. Thomas Clark, Dr. Wendy Scinta, eating, exercise, fitness, food choices, Lean body mass, lifestyle, patient support, self image, success, weight loss on August 1, 2014 by CFWLS. Subscribe to Weight Loss Surgery Success! Would you like to be notified by email when we publish a new podcast episode? Sign up below. Copyright © 2019 Center for Weight Loss Success; Thomas W. Clark, MS, MD, FACS; Newport News, VA. All Rights Reserved.